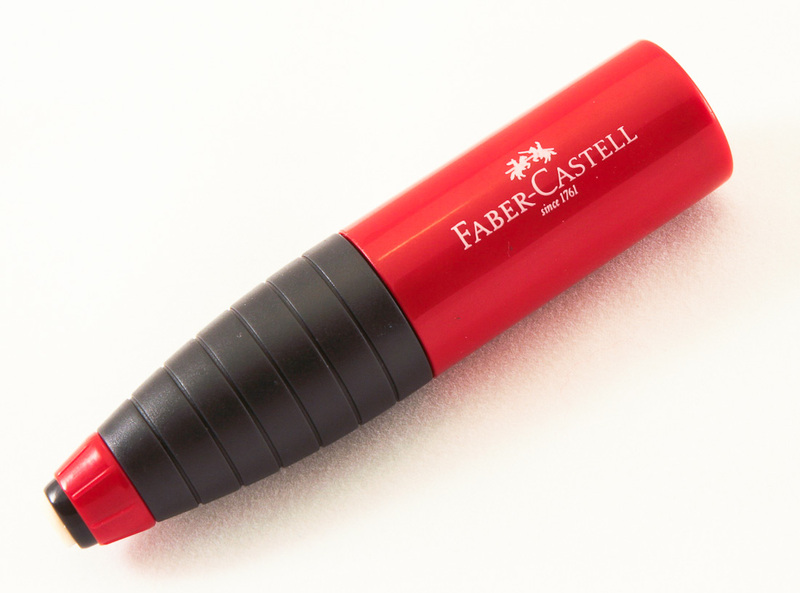 I recently received the Faber-Castell sharpener-eraser pen 18 44 01 as part of the Faber-Castell Grip 2011 Office Set. 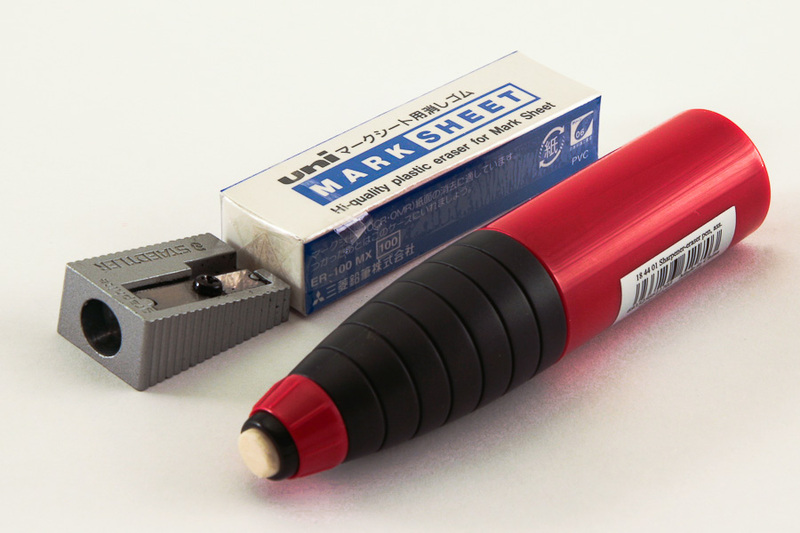 It is a container sharpener with a built-in eraser. The eraser is a twist out style eraser, similar to the one found in the Staedtler 771 – reviewed at Dave’s Mechanical Pencils. Both, the Faber-Castell and the Staedtler eraser, have a 7mm Diameter, but the eraser in the 18 44 01 is about 3 cm long, while the eraser in the Staedtler 771 is about 4 cm long. You could of course fit the longer eraser in the 18 44 01, but until the first centimetre has been used up it wouldn’t be possible to retract the eraser completely. Performance-wise The 18 44 01 is ok, but it’s not a fantastic eraser. It is a bit harder than the eraser in the Staedtler 771 and does its job, but when erasing soft pencil degrees it leaves more traces of graphite than the 771 eraser …unless you use the eraser a bit longer. The sharpener works very well. Compared to other sharpeners it feels as if you need to use less force when sharpening pencils, probably because the blade is very sharp. 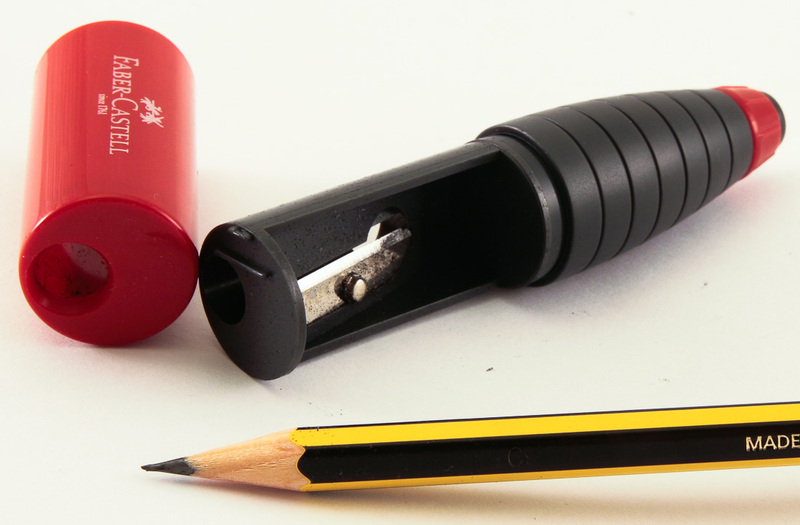 If you turn the case of the sharpener anti-clockwise you can close hole to the sharpener ..very useful as bits of graphite and tiny bits of wood cannot get out of the container anymore and it is then safe to transport the sharpener-eraser pen or put it in a zip-up case. A lead sharpened with the 18 44 01 cannot compete with one sharpened by the top products in this area, but the results are very good, certainly above average. It is best to only remove the case (to empty the container) above a bin or to remember how to hold the 18 44 01 so that the sharpener is at the bottom, otherwise shavings and graphite will fall out. 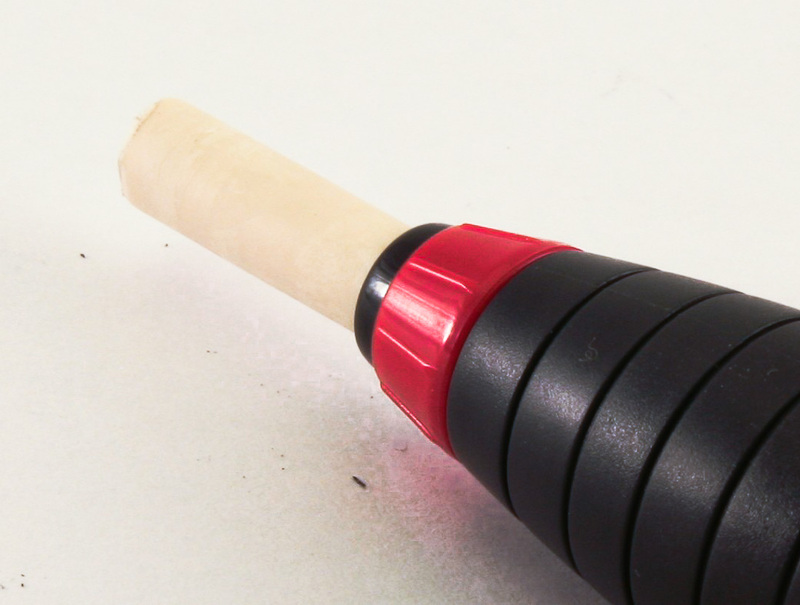 A great idea, but with about 9 cm length and 2 cm diameter the sharpener-eraser pen is on the chunky side and a bit too big to be my everyday companion. I will however happily keep it in a case and use it when the case is open anyway. 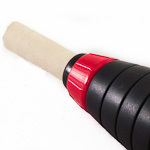 The 18 44 01 is Made in China and available in red and blue. 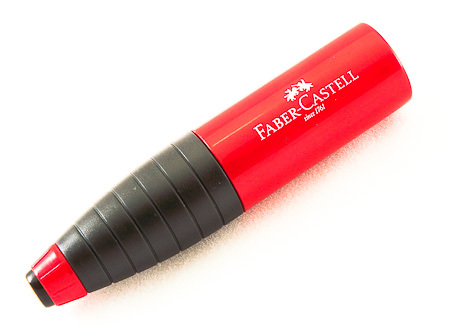 I got this pen as part of the Faber-Castell Grip 2011 Office Set, so I am not sure how much it is in the UK (I could not find a price online). On the continent the 18 44 01 seems to cost about € 2.00. As far as I know replacement blades are not available. I know it’s not super-duper – but it works well and so far it hasn’t come apart or scattered graphite and shavings all over the interior of my bag, like a couple of other ones I could mention. I see the problem, when you’ll have to carry it in your pocket – but for that Faber Castell has a few other solutions, like the perfect pencil line. There are quite a few of these eraser/sharpeners available. I once thought I should make a comparison, but I’d have to buy them first. There is definitely one from Eisen, one from KUM (with a Spanish eraser), and I have seen a few in the UK from brands I did not previously know. Could you tell me where I can purchase refills for this product please?